Some social media channels and websites have adopted a “trending topic” tool on their platform. Places like Buzzfeed and Facebook are capturing the topics most frequently being discussed at any moment in time. Using their own unique algorithms these platforms present the most talked about topics as they are happening. 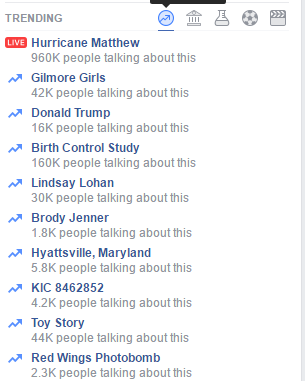 The trending topics on each platform will differ. While Facebook and Twitter are more news-based, Instagram is more about the #ThrowbackThursday. You’re more likely to see breaking news on Facebook and Twitter than you are on Pinterest and Instagram. We know places like Facebook and Instagram use algorithms to determine who sees what content. These algorithms place content in front of users from the people and brands that the user appears to care most about aka brands and people they interact with most frequently. Platforms like Facebook lured business owners in with the initial idea that they could post their products/services and everyone would see their content for free. Now it’s pay for play. Marketers and business owners are noticing a decline in reach. This may seem problematic at first as it seems only a handful of people are seeing your content daily. However, we have established this is not a problem as the people who are being reached are the people who care most about your brand and offerings. What does one do if they are seeking to increase reach but not spend a fortune? You use the trending topics to your advantage. Social media is just that, social. Which means it only works if people are interacting on the platform. If they aren’t, what’s the point? When a topic is trending, posts about that topic tend to surface. In other words, your reach increases without spending anything simply because you wrote about what’s on trend. Where can you find today’s trending topics? On Facebook, you’ll find them on the right hand side of your desktop version. Facebook offers different categories. Users can see what’s a top trend, what’s trending in politics, science and technology, sports and entertainment. Topics will be catered toward each user. On Twitter, the left hand side offers trending topics. Each platform will share information on how many users are discussing this topic. Discovering what is trending today is simple but most people are not writing blog posts and other content on a minute to minute basis. Businesses need to anticipate trending topics. For instance, in October it makes sense that things surrounding Halloween would be trending. It is always a safe bet to write about holidays and the entertainment industry. Dive right into the conversations happening around you and watch your reach increase naturally. Find out how your social media is doing with a free audit.